Alex Thompson oversees Brand Stewardship and Impact for REI. 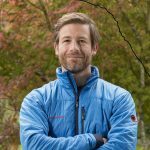 He helps REI to act in the long term interests of the outdoors and our community, leading public policy, government affairs, internal and external communications, sustainability and philanthropy. When not in the office, Alex can most often be found exploring the trails and peaks of the Pacific Northwest with his two pups.